The CFAR alumni workshop on the first weekend of May was focused on the Hamming question. Mathematician Richard Hamming was known to approach experts from other fields and ask “what are the important problems in your field, and why aren’t you working on them?”. The same question can be applied to personal life: “what are the important problems in your life, and what is stopping you from working on them?”. Over the course of the weekend, the twelve of us asked this question of ourselves and each other, in many forms and guises: “if Vika isn’t making a major impact on the world in 5 years, what would have stopped her?”, “what are your greatest bottlenecks?”, “how can we actually try?”, etc. The intense focus on mental pain points was interspersed with naps and silly games to let off steam. On the last day, we did a group brainstorm, where everyone who wanted to receive feedback took a turn in the center of the circle, and everyone else speculated on what they thought were the biggest bottlenecks of the person in the center. By this time, we had mostly gotten to know each other, and even the impressions from those who knew me less well were surprisingly accurate. I am very grateful to everyone at the workshop for being so insightful and supportive of each other (and actually caring). Most of the issues that came up were things I was aware of on some level, but over the course of the workshop it became particularly salient to me how interconnected my problems are and how the gears in the system affect each other. Working memory overload leads to confusion, which reduces confidence. Sleep deprivation reduces working memory and increases anxiety. 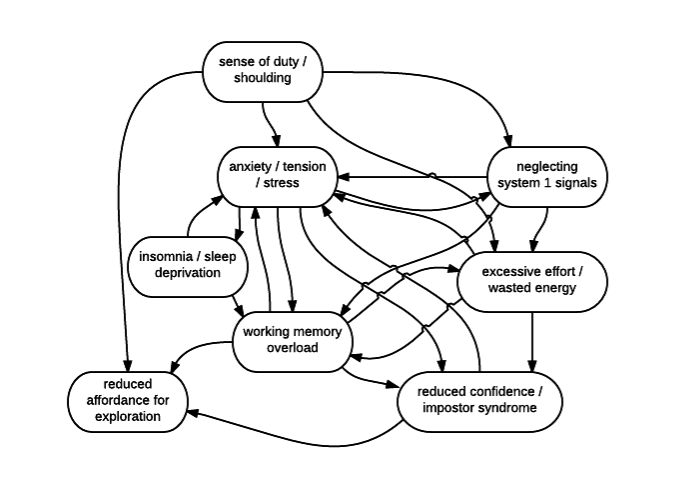 Anxiety reduces the affordance for exploration and creativity, and increases the frequency of insomnia. Ignoring or neglecting signals from system 1 takes up working memory slots with looping messages from system 1, and increases anxiety. After a few of these circular explanations, I gave up on writing them all down, and made a diagram instead. A few things jump out at me about this diagram. The highest degree nodes are anxiety and working memory, both of which are difficult to affect directly. The two nodes I have the most influence over are the amount of sleep I get and the degree to which I listen to system 1 signals. I have started experimenting with sleep interventions that I haven’t yet tried, like taking melatonin 4 hours before bedtime, using a weighted blanket, etc. Attunement to system 1 can be improved through meditation, Focusing, belief reporting and such. While I have sporadically meditated for years, I could use more practice at the other techniques, which involve more explicit internal querying than meditation. Curiously, the graph also appears to have a source and a sink. The source node is my overdeveloped sense of duty and a tendency to assume I should do things or be able to do things causes a lot of downstream issues. It would be impactful to directly hack this and become more selfish, but it appears to be a bit trickier than doing a find-and-replace on my source code, replacing “I have to do X” with “my goals require X”. The sink node has to do with my capacity to allow myself time and mental space for exploration and creativity, which would among other things enable me to do my high-level goals better (e.g. research and organization strategy). A week after the workshop, I moved to California for my summer internship at Google. The context shift and my new location a few blocks down from the CFAR office will allow me to work on my bottlenecks more systematically. I have wrestled with these for a long time, but now I feel that I have better tools and resources than ever before. This entry was posted in life, rationality on May 17, 2015 by Victoria Krakovna.